Recently aside from my lipstick craze, I was on the hunt for some perfect summer shoes. I ended buying 7 pairs of shoes, but I hope that’s the end of this shoe craze. Otherwise, my measly shoe rack at residence will actually break this time. My excuse is that these shoes will actually last me through the spring, summer and fall seasons, but obviously I know that deep down I will buy another pair of shoes if I see the “perfect” FALL shoes. Okay no more of my nonsense shopaholic desires and back to the reason why you are here, my shoe hauls. This post will mostly be filled with pictures of these beautiful finds, but I will also talk about my experience online shopping with ShoeDazzle and Aldo. As well some outfit ideas for my favourite pairs of shoes. LEGO! This Californian shoe company headed by celebrity stylist Rachel Zoe has the latest styles for every type of female at affordable prices ($30-$50). When you sign up for their email subscription, they will personalize showrooms for you each month based on the quiz you completed at the beginning. If the showroom is not to your liking, you can browse through the many various styles they have available online. For me, I would place this as a cheaper version of ShoeMint, a compatible competitor to JustFab and a multi-faceted form of Steve Madden. ShoeDazzle two types of membership, VIP or Non-VIP, VIP Membership requires a $9.95 fee each month, so you have to remind yourself each month if you want to opt out for that month. The benefit of VIP are free (or for Canada $5 off) shipping for your whole purchase, lower prices and the $9.95 fee you pay can be spent on your purchase for that month or saved for a future purchase. I opted into the VIP plan as the amount of discounts (approx. $3 per pair of shoes and $5 off shipping) they offered covered more than the $9.95 membership fee. Since my purchase was over $100, the shipment took much longer to deliver to me as it was held at customs for over a week. I was frustrated as not only did I have to wait longer for my shoes, but I had to pay 15% taxes on top of my initial online order when I went to pickup my shoes. Thus a word of caution, read the small font at the bottom of each site’s shipping description, you may have to pay extra fees and taxes. Especially when orders are over $100 and shipping internationally, hidden fees are inevitable. This is my sole reason why I would not likely shop again with ShoeDazzle, the high shipping flat cost is large and would encourage me to buy more at once to minimize overall shipping costs, but those hidden fees greatly discourages me from buying more than two pairs of shoes. Aside from this major problem of mine, the shoes are as I expected in terms of design, heel height and fit. For shoe size, I used the same size as I would at any old shoe store and they fit like a glove… on my feet that is. The soles of the shoes have not rubbed off yet; the grip on the soles are standard; the materials of the shoes are standard, however, initial wear of a few of the shoes give off a fake plastic smell, but after some wear, the smell goes away. These shoes are great for this season and I’m glad I tried ShoeDazzle out after signing up for their emails for over 2 years, but until I’m not a poor student who can’t pay for heavy shipping fees, I won’t be going back. Time for pics of the shoes! 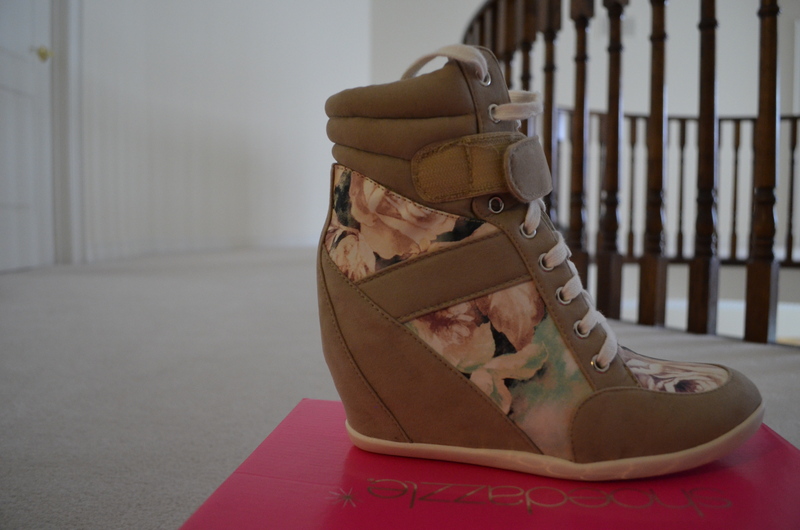 FLUTTER in Blush ($41.50) Sneaker Wedges are so IN this season! ANDREA in Cream ($38.50) Perfect for Weddings or any fancy Gala. YUDIANA in Off White ($39.95) These can be a bit tall but after a bit of Heel Bootcamp, dancing and running in these will be no problem! Or maybe I’m just crazy! PAT in White ($35.95) Looks like white is a trend for my shoes… maybe I should get some colour. DEBBIE in Pink ($29.95) Gladiators of the Year! Too bad it doesn’t have a heel. 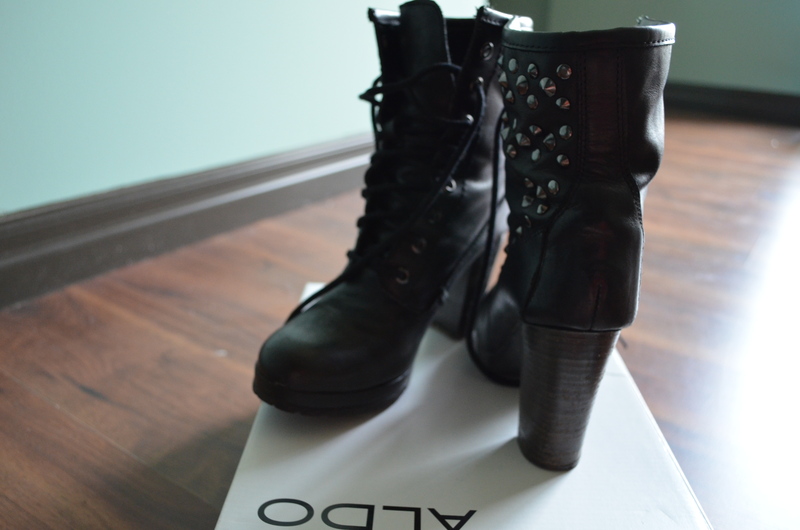 Aldo is a Canadian Brand Name that you can see in almost every shopping mall in Canada, or at least Ontario. I can almost always find a shoe, bag or accessory that I would love to buy when I walk into the store. Once in a while, their online site offers sales for shoes that may not be found in each store, at times like these, I would rather buy the shoes online and secure a shoe in my size. If I receive the shoe and do not like the design, fit or material I can always return it at the store in the local mall. Shoes can run from 30% to 70% off during its online sales. My recent finds are not meant for the hot sandal weather but are perfect styles for the spring and fall. They also give me a bit of height without being 5″+, so I can walk to school or work in these. Before this purchase, I have shopped online at ALDO on three other occasions, so my shopping experience was pretty standardized, here’s a quick recap. Also, for those in Canada, shopping at ALDO will not incur extra taxes and fees for you! DILGER in Black Suede ($52) Love the metallic heel detailing! BINZARTA in Black ($60) Black military boots with heels! What a perfect combo! Did I mention the studs on the side! Now that I’ve bought all these shoes, how can I wear them? Let’s try styling my favourite pairs, the sneaker wedge and the military booties! Styling for a casual day. 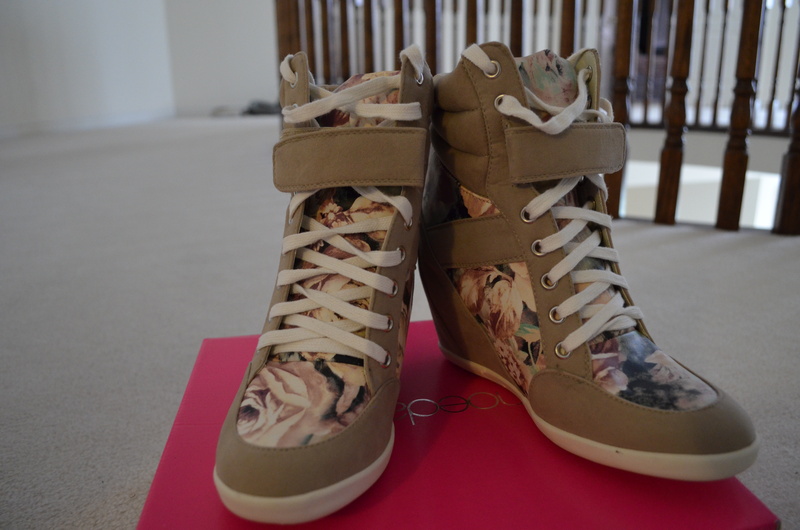 For the sneaker wedges, you can pair any school outfit or casual day outfit. The best combo would be whatever pant colour that matches your shoes to elongate those beautiful legs of yours. For me, since my shoes are white and beige, I would pair shorts of any colour, white pants or khakis. The top can be any blouse, sweater or tee, whatever floats your boat. Time to rock out in those boots! These shoes also go with almost any outfit, but the best would be to roughen up a girly dress or blouse-skirt combo. I also like pairing military boots with outfits that already have a bit of punk-edge in it. Here, I paired my dark grey canvas vest from Forever21 with these boots to further elongate my figure. It kind of draw a line down towards my shoes. Oh and don’t forget a punch of retro and colour in your outfit with spunky sunglasses like these mint ones from ALDO. Leave a comment on your fave shoe shops or your experience with ShoeDazzle or ALDO! He I thinks this website is one of the best I have ever seen. Please keep up the good postings. U have a very nice weblog over here. I just wanna thank you for all the interesting info on it. I’ll follow your weblog if you keep up the good work! U have a awesome website over here. I just wanna say thanks for all the interesting info on it. I’ll follow your website if you keep up the good work! same topics discussed in this article? I’d really like to be a part of group where I can get comments from other experienced people that share the same interest. If you have any suggestions, please let me know. Thank you!